On an average Japanese car you can start sanding with a #400 grit sandpaper or possibly a 1000 grit and then move on to a 2000 grit sandpaper. However the German car headlights like BMW I recommend starting with #220grit sandpaper especially if the headlights are not completely oxidized looking either yellow or whitish. Start polishing your headlights by applying a dime size amount on the white towel enclosed in your headlight restoration kit. When you finish polishing your headlights would have a little brighter look. It doesn’t have to shine! 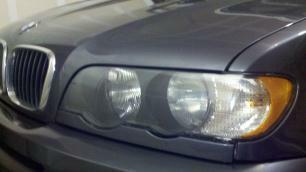 v. Spray Pre-treater on the headlight lenses and leave it for about 10 to 15 seconds then wipe dry. The pre-treater strips away all residual polish and grease from the lenses plus it opens up the pause of the headlights to accept the sealer to make an excellent bond. vi. Finally Seal your now clean headlights to look like new. This is where the magic happens. From step ii to iv all you were doing is only cleaning your headlights. By using a high quality headlight restoration sealant like the one we provide in our headlight restoration kit make a huge difference. Fold the blue towel from the kit and saturate about one inch of it with the sealant and apply from side to side overlapping each pass about 50%. At this point you will see your BMW headlights transformed from being clean headlights to headlights that look like new. To order the EZ4U2 Headlight Restoration Kit simply click on the Order Now Button below and we will ship it out the same day or the very next day depending on the time we receive your order. 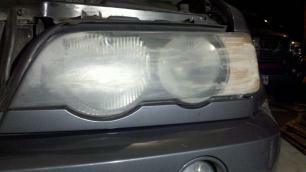 So order now and have your BMW looking like new again with impressive new looking headlights. I promise you, you will be glad that you did.